Monte says the trout find this Callibaetis pattern irrisistable. 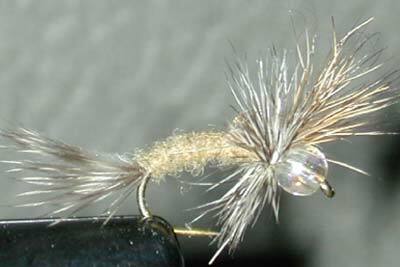 The third featured fly of our fourth fly swap, which was sponsored by Tim at Yagers Flys is from Monte Smith. "I developed the Bubble Boy while working to create a series of emerger patterns that float correctly on the water. Hanging in the surface film during this vulnerable stage, the trout seem to find it irresistible. If it does begin to sink, it is at a very slow rate which allows the angler to fish the first few inches of water where fish tend to concentrate," says Monte. Monte says that he loves fishing this pattern during Callibaetis hatches. "I have found it effective just as the mayflies are beginning to hatch, during the hatch (including some terrific results during heavy hatches), and afterward as a cripple. It's a very versatile pattern that is fun to tie. I hope it brings you much success!" Hook: TMC 2487, #12 -14. Head/Aura: Round 3mm pearlescent plastic craft bead. 1. Slip the plastic bead onto the hook before placing the hook in the vise. Attach the thread and work your way back to the bend of the hook. Select a few grizzly marabou fibers and tie in at this position for a tail. Make sure that the tail (really a trailing shuck) points downward around the bend. 2. Dub a sparse, tapered body to a position slightly short of the bead. 3. Select a small amount of natural deer hair (don't overload it) and tie it in with the tips extending forward over the bead and eye of the hook. As a general guide, length of the wing is about equal to that of the body. This represents the emerging wing, so it's not necessary to have it perfectly stacked and neat, though it certainly can be. 4. Secure the wing with your thread, but do not trim the waste ends yet. Wrap a small thread base with three or four wraps to serve as a foundation for the hackle. 5. Attach the hackle in this slot between the butts and the wing itself, then wrap it two or three times behind and once in front of the wing. 6. Tie off the hackle and snip the excess hackle. With your thread now in position between the wing and the bead, perform a whip finish (which will help stand the wing up a bit). 7. Grasp the waste ends of the deer hair used for the wing and carefully clip them, leaving an 1/8" or so right on top of the shank.